NASA's New Horizons spacecraft is back "awake" and being prepared for the farthest planetary encounter in history – a New Year's Day 2019 flyby of the Kuiper Belt object nicknamed Ultima Thule. Cruising through the Kuiper Belt more than 3.7 billion miles (6 billion kilometers) from Earth, New Horizons had been in resource-saving hibernation mode since Dec. 21. Radio signals confirming that New Horizons had executed on-board computer commands to exit hibernation reached mission operations at the Johns Hopkins Applied Physics Laboratory in Laurel, Maryland, via NASA's Deep Space Network at 2:12 a.m. EDT on June 5. Mission Operations Manager Alice Bowman of APL reported that the spacecraft was in good health and operating normally, with all systems coming back online as expected. Over the next three days, the mission team will collect navigation tracking data (using signals from the Deep Space Network) and send the first of many commands to New Horizons' onboard computers to begin preparations for the Ultima flyby; lasting about two months, those flyby preparations include memory updates, Kuiper Belt science data retrieval, and a series of subsystem and science-instrument checkouts. In August, the team will command New Horizons to begin making distant observations of Ultima, images that will help the team refine the spacecraft's course to fly by the object. 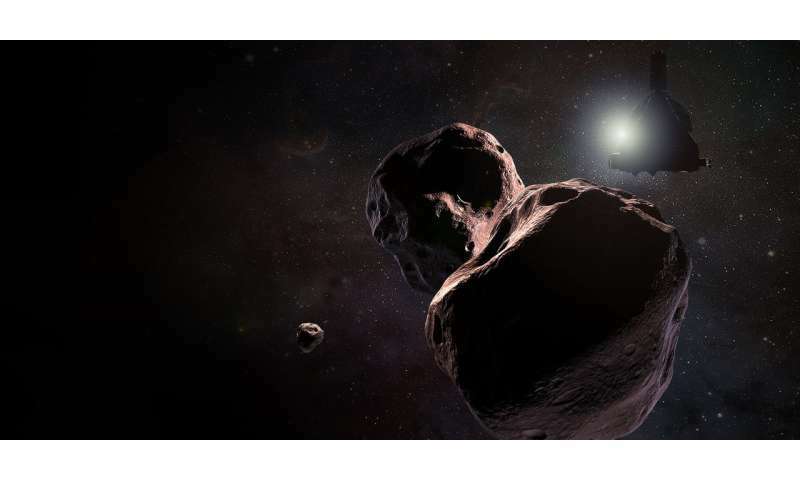 "Our team is already deep into planning and simulations of our upcoming flyby of Ultima Thule and excited that New Horizons is now back in an active state to ready the bird for flyby operations, which will begin in late August," said mission Principal Investigator Alan Stern, of the Southwest Research Institute in Boulder, Colorado. New Horizons made a historic flight past Pluto and its moons on July 14, 2015, returning data that has transformed our view of these intriguing worlds near the inner edge of the Kuiper Belt. Since then, New Horizons has been speeding deeper into this distant region, observing other Kuiper Belt objects and measuring the properties of the heliosphere while heading toward the flyby of Ultima Thule—about a billion miles (1.6 billion kilometers) beyond Pluto – on Jan. 1, 2019. New Horizons is now approximately 162 million miles (262 million kilometers) – less than twice the distance between Earth and the Sun – from Ultima, speeding 760,200 miles (1,223,420 kilometers) closer each day. On June 5, 2018, New Horizons was nearly 3.8 billion miles (6.1 billion kilometers) from Earth. From there – more than 40 times the distance between the Earth and the Sun – a radio signal sent from the spacecraft at light speed reached Earth 5 hours and 40 minutes later. The 165-day hibernation that ended June 4 was the second of two such "rest" periods for the spacecraft before the Ultima Thule flyby. The spacecraft will now remain active until late 2020, after it has transmitted all data from the Ultima encounter back to Earth and completed other Kuiper Belt science observations. I hadn't heard of the unofficial nickname 'Ultima Thule' which NASA gave to 2014 MU69 in March. With substantial public input, the team has chosen "Ultima Thule" (pronounced ultima thoo-lee") for the Kuiper Belt object the New Horizons spacecraft will explore on Jan. 1, 2019. Officially known as 2014 MU69, the object, which orbits a billion miles beyond Pluto, will be the most primitive world ever observed by spacecraft – in the farthest planetary encounter in history. The latin adjective for " beyond " is " ultra ".